WASHINGTON — Republicans in the U.S. Congress are ratcheting up pressure on Canada to get a deal done on the North American Free Trade Agreement. House of Representatives majority whip Steve Scalise, who represents the state of Louisiana, delivered a stern warning Tuesday about "growing frustration" in Congress with what he calls Canada's "negotiating tactics." In a statement, Scalise says Canada is running out of time to get on board with the bilateral agreement in principle negotiated last month — without Canada's involvement — between the U.S. and Mexico. "Members are concerned that Canada does not seem to be ready or willing to make the concessions that are necessary for a fair and high-standard agreement," the statement reads. "While we would all like to see Canada remain part of this three-country coalition, there is not an unlimited amount of time for it to be part of this new agreement." That appeared to be a response to recent indications from the federal Liberal government in Ottawa that it won't be held to an artificial deadline, nor will it rush the talks to settle for an agreement that it doesn't consider fair or good for Canadian industries and workers. 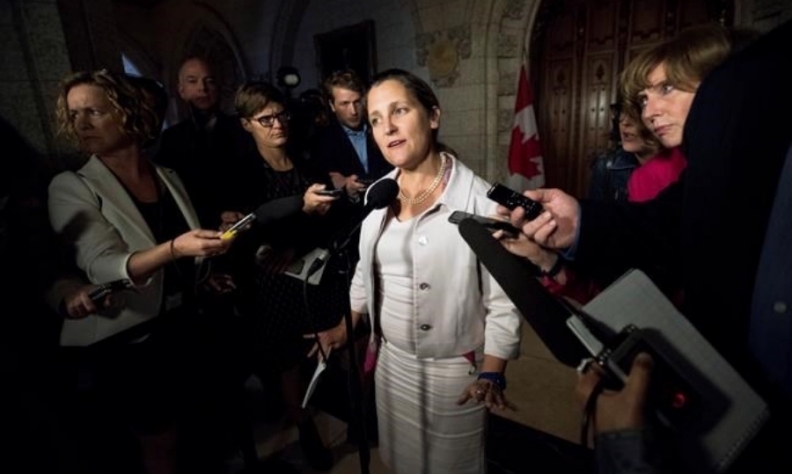 Foreign Affairs Minister Chrystia Freeland, who is scheduled to return to Washington and resume talks Wednesday with U.S. Trade Representative Robert Lighthizer, had not seen the statement when asked about it prior to question period. But she said Canada has been negotiating in good faith throughout the 13-month process, and took issue with any suggestion to the contrary. "From the outset of these modernization negotiations, Canada has been extremely co-operative," Freeland said. "Canada is very good at negotiating trade deals; Canada is very good at finding creative compromises. We have been extremely engaged."